Doc - as far as getting frustrated. The pixies are limited that’s why they are more affordable. They are by far the easiest LOR pixel controller to set up- that was by design not by being behind. Affordability gives users an entry point to pixels. Try setting up a pixcon16. I recently had the opportunity to set one up and had it not been for my friend Mr. P it would still be in a box. This is a fun hobby, easy to get frustrated while trying new stuff but all of us here have your back if you ask. You know that. Hang in there and test stuff rather than read about it. LOR and other mfgs are conservative when it comes to various stuff. You have plenty of time to learn this before the holidays, you’ll be a pro. Can someone post pictures of how this looks in practice? I too have been thinking about longer runs but I dont really like the idea of running two sets of wires and splicing to inject power. Where is the integrated five wire solution? For roof line mounting. If I need to inject at pixel 65... why is there no pre-fabricated strand which extends power (skipping over the pixels) to inject at the right spot? The reason you break is because you commonly need more than 1 PSU. and fused source. PSU's that are designed to be wired in parallel are expensive (Lambda comes to mind). Second, you have 20ga wire (string) and 16A of supply. What happens when a single fuse blows on a multi-inject string? 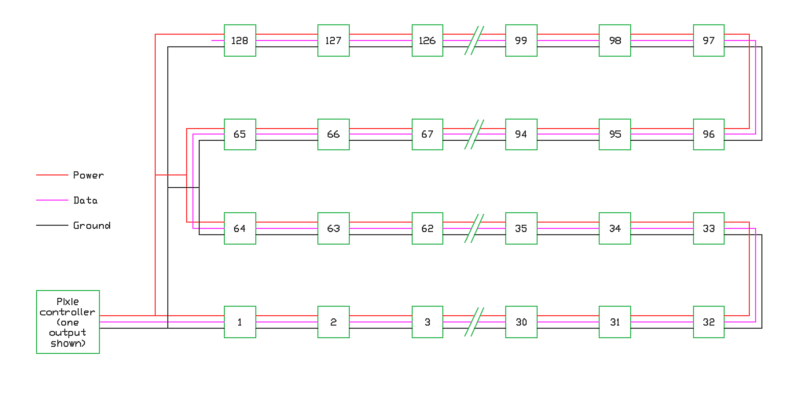 BTW the drawing also incorrectly shows the plus coming from the board (which can not support that many nodes per port. and Grounds MUST be used to all inject points. Current flows in a loop and we fall back to that 20ga wire issue) One could just connect that to a separate PSU and just power the Pixie from a 12V wall wort. Correct when using more than one power supply. and there has been a lot of discussion about the need to do that when for example, one power supply feeds at pixel 1 and the other feeds at pixel 128 (using this example. The drawing was done to demonstrate what had been talked about in an earlier post that specifically stated that the Pixie could not handle that many pixels unless highly restricted levels. In reality in order to operate at any where near full 100%, you would need to use a separate power supply and split this up. However this would work just fine if you restricted levels to a low enough value (you would have to measure it to know exactly what lever that would be). As shown, except for the wire from the controller to the power T, no pixel wiring needs to carry the current for more than 32 pixels (which is no problem at all - even at 5 volts). Run a piece of SPT-1 along side the pixel wiring to handle the power injection. I don't think it would be practical to make a five wire solution because the PI wires would so seldom be used. Ok I have settled down. I guess I will chalk this up as an expensive learning mistake on my part. I bought one of these HC nets. What would be the most common method for doing this in LOR with a pixie? Is the term zig zag and fold the same? I like to get started getting my lights in the net tomorrow. oh am I going to run into the same issue with a mega tree. 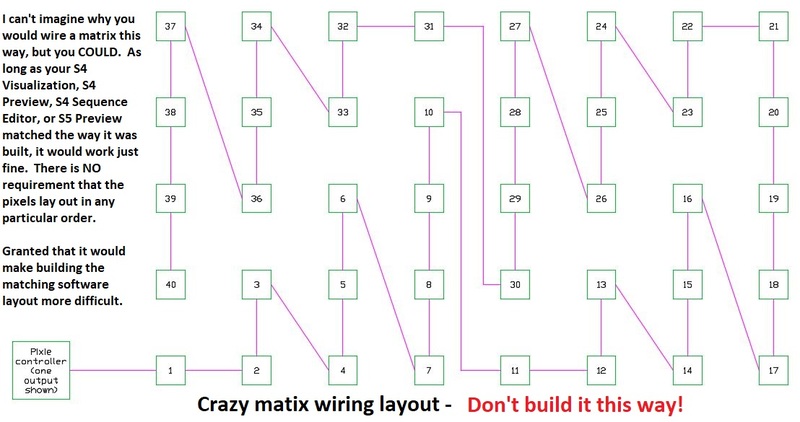 It’s basically a matrix shaped like a tree. Can I go up 50 pixels and then back down 50? DOC- What program are you using to run your Matrix, PE, SE, SS? It's really not so complicated. If you're programing using PE or S5, here is my advice. Set up your matrix using the folds in your preview design, then you won't have to worry about "Zig Zag" on the controller, just the starting points for each output. Just make sure your predefined settings match the ones on the Pixie and you should be up and running. If you're running 128 pixels per output, you will need Power Injection, but you could do it at the beginning and end of the 128 pixel run. I suggest you run it off the power supply directly and only connect the data and V- of pixel 1 to the Controller. This is assuming you are using 12v. If it's 5v, you may need to connect at each row. My Matrix is 63 Pixels high by 126 wide. (Now I run mine off 4 Pixcon16's, but the design is the same) I made each string 126 long, (63 down, 63 up) I connect one power wire for every 2 runs, connecting at Pixel 1 and Pixel 126, then another wire on Pixels 127 and 252, etc. and haven't had any power issues, as I don't run it at full white and only at 75% anyways. In your case, looking at the pic provided from Jim, you could connect power at Pixel 1 and Pixel 128 and should be just fine. Most rules say every 50 for 5v and every 100 for 12v, but the way I look at it if you're connecting it at each end of a strand of 128, each point powers 64 pixels. I've had it do 3 before during testing. Huge dif between a pixie and pixcon. Pixcon gives you the ability to configure the zigzag while setting it up. I will let you all figure it out. Maybe S5 will work but if SS wouldn't work I don't know why S5 would. Even if you can get the config to work how about the sequencing? If you are new and sequencing your own it will be a task in itself. If using donor sequencing there is still a bunch of work to be performed. Where as using straight lines per port and its copy paste for those using donor sequences. Zig zag and fold are dif but the most common and easiest way for a pixie is straight rows each per port. Honestly I am learning everything as I go. I switch to S5 on my laptop wow it’s different. I still have S4 on my show PC but that’s Incase I fail at figuring pixels out. I am going to update my profile. Most I have done in S5 is outline my house and well it looks as though it works in the program. I like to see it work in reality using pixels so I bought the matrix net. Figured what the heck. If I figure a matrix out I should be good to go. I guess I've always sequenced my matrix through PE and/or S5 using Motion Effects which doesn't require you to program each pixel like SE does. Which is why you don't need to worry about setting the zigzag on the controller settings. When you create your prop it will show up as a single line (or more if requested) for sequencing instead of each and every channel/pixel like SE does. If I remember correctly from last summer, I was able to use the Pixie on props with folds in the preview design. My understanding is a "Fold" is used when setting up the prop in the preview design. Zigzag is for setting it up on the controller itself. I'm sure there is a more scientific, long winded definition, but I haven't had the need to use zigzag, so I can't really explain a whole lot. If you get stuck setting it up let me know. I too used the HC Pixnets for my matrix, only I stacked them so each section of my matrix is made of 2 nets 63 pixels high and 15 wide, times 4-1/2 making it 8-1/2 nets wide x 2 high. I must be missing something here. Without Zig Zag in the controller, the pixel counts follow the physical strings as shown in my diagram. With Zig Zag in the controller, you could have them appear to be 1 - 32 (left to right), then 33 - 64 (left to right), then 65 - 96 (left to right), and lastly 97 - 128 (left to right). So what? It makes absolutely no difference. You can put the pixels in any order that you care to. As long as you build it in Visualizer, Pixel Editor, Sequence Editor, or S5 Preview Editor in the same way that you built the actual lights, it will work fine. Now, granted that it might take more time to set it up (only need to do once), but as long as the editor and the actual lights match, it will work fine. The drawing below is ONLY to illustrate this concept. I DO NOT recommend that you build it this way - but it absolutely would work! Yea I came to a stand still on the project. I did a lot of research instead yesterday and JR was right. Might be too much a hassle. So what I bought supplies for isn’t going too work so I am on standby until I determine what I am going to do. I read through a few prop designs and it seems one row per port is the norm on the pixie. You can buy a pixie 8 and wire it to the same power supply provided with your pixie16. If you purchased from LOR it is a 500 watt psu. This should be fine for a matrix up to a certain number of pixels as long as you mount the controller on the matrix. Super easy to do. Or buy the pixie8 and a cheap 350w psu and cg1500 box. use both in unison. I built all of my pixie controllers so I have a large box that holds both controllers and my 750 w psu however all you need is a cg1500 and some wire and your problem would be solved. Of course that gives you a 24X ….. matrix. I do not know of anyone doing it any other way with a pixie. The pixies are for us K.I.S.S. people. On LOR’s pixel tree package they do a fold? Looking into the future once I have this matrix done. I plan a tree next. A tree is nothing more than a matrix. Is the norm to run each string without a fold or with? Obviously since LOR tree has a single fold they make sequences for a fold. Just don’t understand why not for a matrix. That tree is the 25 node tree , 25 up and back down or over. Brian built the SS vis and it allows the sequence to play right. Just like circles - it’s 50 per string however they are split in half in the vis with the vis sending the signal to the required pixels as sequenced. Yes, less complicated and if buying or sharing they are copy paste. As far as I know Brian is the only one making those sequences for the 2x25 trees. Im not sure how many he has now but they are very nice. You could alsoget the tree vis rom his site and see if you can lay it in its side in SS and manipulate it. If anyone can do it , it would be Brian.